Social media is a critical aspect of event promotion. Here’s the good news: Hootsuite and Eventbrite are teaming up to bring you the tools and the advice you need to become an event promotion rock star. Over the next few weeks, we’ll be sharing a wealth of content describing best practices for social media event promotion. We’ll share tips and tricks that will help you boost attendance and increase social engagement around your events. 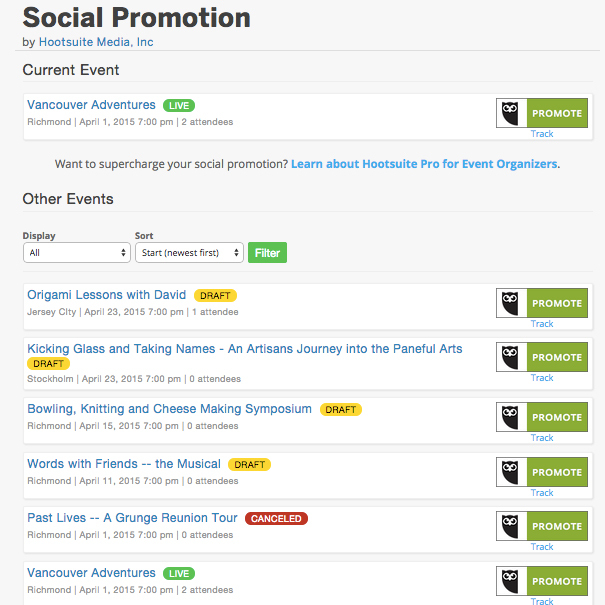 To tide you over in the meantime, we are excited to introduce the new Hootsuite extension for Eventbrite! Now event planners can extend their invitations’ reach by amplifying via Hootsuite, directly within the Eventbrite dashboard. This Hootsuite integration will be part of the first wave of extensions featured in the introduction of Eventbrite’s Spectrum ecosystem. Eventbrite Spectrum will connect event organizers who rely on Eventbrite to their favorite business tools to make them even more effective in their roles. Eventbrite users, rejoice! You can now be more efficient in how you manage your social media promotion, while tracking performance to see which channels should get more love. Note: The current release of Eventbrite spectrum is available to visitors to eventbrite.com only. If you are a non-US user and would like to use this integration, scroll to the bottom right hand corner of your eventbrite page and change your country to “United States”. To learn more how Hootsuite and Eventbrite can drive your event promotion, please visit partners.hootsuite.com/eventbrite.